How many homeless people are living in Toronto? What would we need to do to permanently solve Toronto's homeless problem? 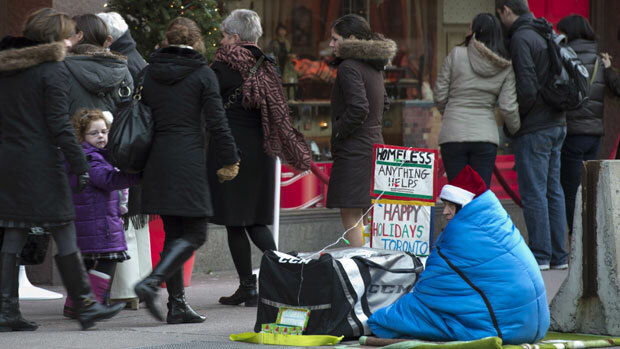 Homelessness is much more common in large urban cities like Toronto, Vancouver, Edmonton, Calgary, and Montreal. It is a constant presence and a symptom of a city's bloated real estate prices and the people who fall through the cracks of society. 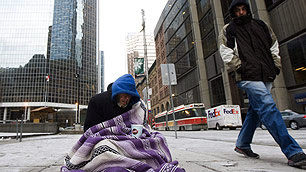 According to a 2007 report the annual cost of homelessness in Canada is approximately $6 billion in emergency services, community organizations, and non-profits. Mathematically that means homelessness is costing governments approx. $20,000 per year per homeless person. Also, contrary to stereotypes, only 6% of homeless people suffer from schizophrenia. Depression and affective disorders affect 20 to 40% of homeless people. #1. Renting an apartment in Toronto is too expensive and there isn't enough low income housing in Toronto. #2. There is a market for smaller apartments that are priced for people in a lower income bracket. #3. There needs to a safety net for people who are "temporarily homeless" to help them find a new apartment quickly. #4. For the 6% of homeless people (approx 3,000 people) who suffer from schizophrenia there needs to be a safety net to help get these people treatment. Special places for the 3,000 schizophrenic homeless people in Toronto. This would require a significant investment in real estate and care services. A government agency designed to help people who are temporarily homeless to find a new place quickly. More subsidies for low income housing. Enough for approx. 47,000 people. More new apartment buildings being designed with a portion of the apartments designed for lower income people. If every new apartment / condo building in Toronto was required to have just 1% of their units designed for lower income people we could solve this problem pretty quickly. We should also note that the Canadian government USED TO have such measures in place. Back during the 1980s there was abundant support for instutions geared towards helping schizophrenic people, and the building of new structures for low income housing was dramatically higher - in 1986 alone the Canadian government supported the building of 30,000 new units - but over the years the numbers kept dropping, reaching a mere 7,000 in 1999. So really supporting such measures would really be about going back to the ways things used to be done in the 1980s and earlier. Now you might think "Hey, doesn't Toronto already have homeless shelters?" Well, yes, we do. But homeless shelters are not a permanent solution - and their rife with crime, theft, sexual assaults, assaults, drug problems. Most women refuse to stay in homeless shelters because they're not considered safe. Even women-only shelters are dangerous. "Canada is the second coldest country on earth and with a climate like Canada’s, energy, like food and housing is a necessity of life." - Edward de Gale. "Over 50,000 households a year have their power disconnected in Ontario while thousands of others struggle to provide the necessary energy to stay warm and cook meals. That’s one household with their power cut every 10 minutes, every hour, of every day, for a year." - Edward de Gale.